English Expat living in Switzerland, restarted modeling after moving here. Modelling interests are Spitfires, Cold War Jets and WW2 naval aviation. 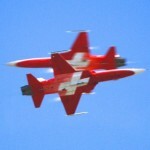 Also like to go to air shows to see and photograph the real thing. April awards, random award 04-2017.